When most people think about the food garden, they think about annuals like tomatoes, cucumbers, and broccoli. But there are many perennial vegetables, fruits, and herbs that will grow in all but the very coldest gardening zones. Every year we try to plant edible perennials in our garden. Our goals is that over time we’ll have more harvest with less work each season. Learning to eat what we have is a big part of reaching this goal. While I would love to have spinach whenever I want it, it only grows for a short season here. However, the moringa produces for about nine months here and it’s a perennial vegetable, so we content ourselves with moringa instead of spinach. In our effort to grow more edible perennial plants we’ve been doing quite a bit of research, we don’t currently grow all of these plants and some we’ll never be able to grow because of our climate. That will be the case for you too. If you don’t really understand terms like gardening zones (both cold and heat), frost dates, chill hours, and day length we have short ecourse that will help you understand how these things affects your garden. What’s the difference between perennials, biennials, annuals? Perennial plants are plants that will live for more than two years. It might die back and then come back when the conditions are right, like asparagus. Or it might live year after year without dying back, like mint if you live where it doesn’t get very cold. There are some plants that are a perennial in one climate but can only be grown as an annual in another climate. This is usually because the plant cannot survive cold winters. If you live in USDA cold hardiness zone 9 or above you can probably grow most of these perennials as perennials. But there will be some you can’t grow at all, like rhubarb, because they need the cold. Biennials life for two years and then die. Most common edible biennials are harvested in their first year, however, if the aren’t they set seed in their second year and then die. Some common edible biennials are carrots and onions, they develop their root or bulb the first year and then go to seed their second year – although if you have a crazy weather year they might go to seed the first year thinking it’s the second. Annuals are plants that just produce for one season and then die. Most vegetable gardens are planted with annuals. They’re tasty but require more work than perennial plants do. One of the positives about perennial plants is that you only have to plant them once. That’s also one of the negatives in that you need to think carefully about where to plant them. You’ll want to plant your edible perennials where the soil won’t get disturbed by your other plantings or get in the way of your other plantings. You’ll also want to make sure you give it plenty of room to mature. You can certainly plant other things with your perennials, just be intentional. You’ll also want to make sure that you top dress the perennials with compost at least yearly to feed the soil. The soil is super important for perennials as they will require food year after year and not just for a season. It’s easy to forget about them so make a note in your gardening notebook to remind yourself. If you need to work on building your soil I highly recommend The Art of Gardening ebook. If you need help knowing how much to plant for your family, these harvest planning sheets are a great place to start. Just enter your email in the form below. Rhubarb needs quite a few chill hours and mainly grows in the north, officially in zones 7 and colder, as a perennial. In fact, it grows wild in many areas. However, there are some who are growing it in zones 8 and 9 over winter as an annual. Asparagus grows as a perennial in zones 3-8 but I’m able to get a modest harvest in zone 9 by planting them where they get some afternoon shade and cutting them back in at the soil line in early January. Learn how to grow asparagus and strawberries in the same bed. Artichokes will grow as perennials in zones 7-11. But can be grown as an annual in zones 4-6. Jerusalem Artichokes also called sunchokes are a member of the sunflower family and are grown for their nutty flavored tubers. They’re a perennial in zones 3-8. Bunching Onions – I call these repeater onions because I can repeatedly harvest from them, they’re called green onions in the grocery store. They can be grown in zones 3-9. They will flower and set seed and then the seeds will produce more onions, all the while, the original plant doesn’t die unlike storage onions. I never pull them, I just use scissors to clip the greens. 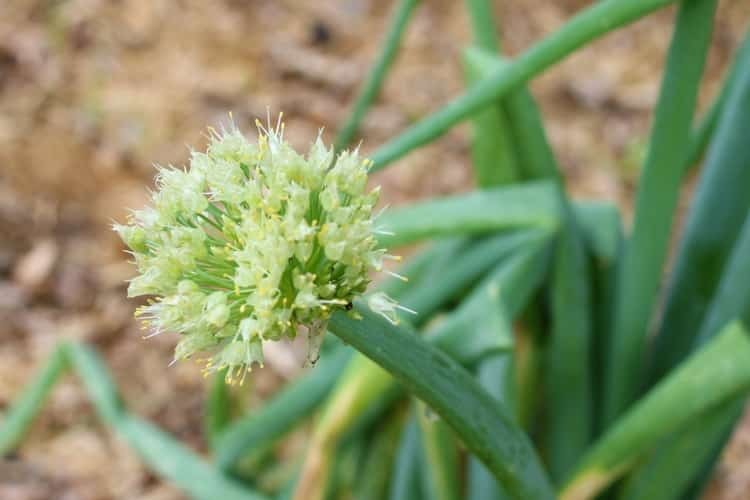 There’s also an Egyptian Walking Onion that is a perennial in zones 4-8. Daylilies are usually grown as an ornamental plant, but they’re edible, in fact according to the USDA all parts of the daylily plant are edible. But you need to be sure you’re actually growing daylilies and not another kind of lily. Here’s a good article on what to look for. Daylilies can be grown in zones 4-9. Prickly Pear Cactus is usually grown in dry hot climates but some varieties are cold hardy to zone 3 – some say 2 – either way, that’s most of North America. The great thing about prickly pear cactus is that it’s both a fruit and a vegetable. The pads are used in many Mexican dishes and go by the name of “nopalitos”, they’re delicious. And the fruit can eaten raw, used in smoothies, or juiced to drink or make jelly. It has a flavor similar to watermelon but grainier. Moringa is called the tree of life in many cultures because it can be grown where other plants won’t survive – in dry, poor soil. It can be grown as a perennial in zones 9 and higher but it’s so fast growing that it can be grown as an annual in all climates. The leaves and the immature seed pods are edible. Learn how to grow moringa. Scarlet Runner Beans produce a green pod just like “regular” pole beans but their flowers are red and the vine is a perennial in zones 7-11. However they can be grown as an annual in colder zones. Learn to grow pole beans. Sweet Potatoes are normally grown for their tubers but their leaves are also edible (unlike white potatoes). They can be grown as a perennial in zones 8-9, they’ll die back in the winter and then pop up again in the late spring (if you don’t harvest all the tubers and roots.) They can be grown as annuals in colder zones. They can also be grown in pots and brought indoors for the winter to enjoy a secondary harvest of leaves. Learn how to grow sweet potatoes. Fruit trees are clearly perennials since they live (in theory) for more than one season. The thing is most fruit trees take years before they produce fruit. However, there are some fast producing fruit trees that will produce in their first or second year. Berries – pretty much anything that has berry in the name is a perennial. Some, like mulberries, grow on trees. Some, like blueberries, grow on bushes. And some, like strawberries grow on small plants or vines. There are berries that will thrive in every climate, just because you can’t grow your favorite don’t give up on growing berries at all. 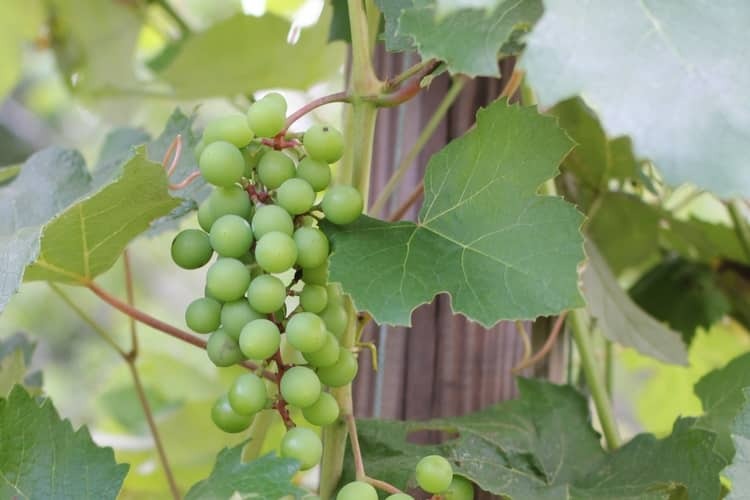 Grapes are another plant that probably has a variety for your climate. Maypop or Wild Passion Flowers are our new favorite perennial fruit. They are a perennial in zones 6-11 and can be grown as an annual in colder climates. The maypop is native to North America and is considered a weed. It can propagate from seeds, cuttings and the roots which means it can be invasive. The fruit and the leaves are edible. Hardy Kiwi is another vining fruit and is cold hardy to zone 6. It’s not the same fruit as the fuzzy kiwi you buy in the store but it tastes similar. Also you need a male plant and a female plant to get fruit. Most herbs are perennials in most climates. The great thing about herbs is that they are relatively compact and you don’t normally need a huge amount of them so they can be grown in pots and brought inside in colder climates. Mint is said to be invasive but it’s worth planting. If you don’t have much room to let it sprawl, plant it in a pot to keep it’s roots contained. There are literally hundreds of varieties of mint so experiment a bit. Most mints are cold hardy to zone 3 and spearmint handles heat the best. Lovage can be grown in zones 4-8 and it can be tricky to start from seed. Lemon Balm (or Melissa) can be grown as a perennial in zones 4-9 but needs to have a winter mulch in zone 4. Thyme has many varieties and most can be grown as a perennial herb in zones 5-9. Sage can be grown as an annual in zones 5-8 but needs to be cut back regularly to keep it from getting woody. In warmer climates it’s usually an annual because it doesn’t tolerate long hot summers, but I’ve had success growing it in dappled shade for more than two years. 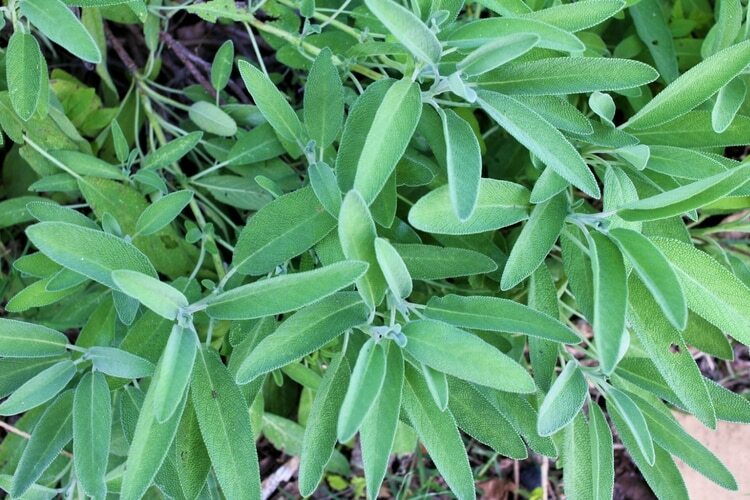 Learn to grow sage. Lavender can be grown as a perennial in zones 5-9 but they struggle in areas with high humidity. Echinacea (or purple coneflower) is another herb that can be grown in most climates. It’s hardy in zones 3-9. Rosemary can only be grown as a perennial in zones 8 and warmer. Oregano will need to be mulched during the winter but will often come back in the spring. Comfrey will grow in zones 3-9 (some say 8 but I grow it just fine). It dies back in the winter and emerges in the spring. Learn to grow comfrey. Chives are a member of the onion family and there are several varieties. Chives grow well in zones 3-9. Sorrel can be grown as an annual in zones 5 and higher. 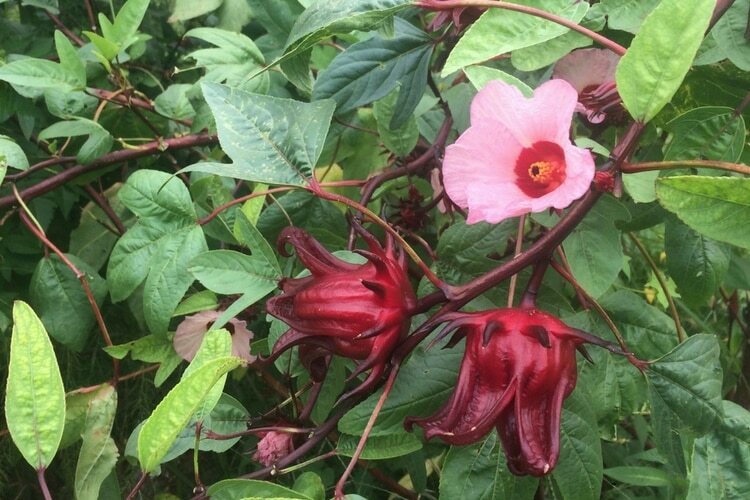 Edible Hibiscus can be grown as a perennial in zones 8-11 and as an annual in colder climates. Learn to grow hibiscus. So there you go, lots of edible perennials for you to choose from for your food garden. What perennial vegetables, fruits, and herbs do you grow? Share your recommendations in the comments. I grew up in, & still live in coastal Southern California, zone 9-11. We always had a rhubarb plant that was a perennial. The one my parents had when I was a child was there when they bought the home when I was 6 & was there for years & years, giving us many pies & sauces in its lifetime. In my garden, I still grow rhubarb, & it is a perennial. I’m not sure I’d bother with it if I had to plant it yearly as it takes a while to get really robust with our clayey soil! Perhaps there is a particular variety of rhubarb that you were referring to that requires chilling? Because the ones here get very little chill; we don’t have enough chill for cherries or peonies, & only some apples. That’s awesome! The resources that I found all say that rhubarb needs between 400-500 chill hours (hours at or below 45 degrees F) in order to produce in the spring, (here’s one, http://pubs.ext.vt.edu/438/438-110/438-110.html). Although I’m sure there are variances depending on variety. Unfortunately, we also have super long hot summers and spend many days over 100 degrees. I live south of you in CC. I have never had any luck growing echinacea and was wondering your secret formula of sun, shade, water. I love it’s beauty in the garden, as a cut flower, and it’s health benefits. I always take the full sun label lightly as our blistering sun is often too much. What is your experience with growing it successfully? Hi Gayle. I plant mine where it gets afternoon shade. I have a book on native plants from the extension service in Austin (I realize our climates are different than theirs but the book has a lot of good info) and it lists echinacea as growing in part shade which only 2-4 hours of sun a day. Mulching heavily and watering well is also something you’ll want to do. Hope this helps. I’m in zone 9 , coastal CA. We grow runner beans, rosemary, thyme, mint, and oregano as perennials. My pepper plants have been overwintering too. So we are getting year round jalapeños. Someone gave me a blueberry bush last summer. I thought I’d killed in when it lost all its leaves, but it seems to be leafing out again. Do they normally loose leaves in the winter? Yep, they sure do, even in mild winters. I am very new to your website but love it already. 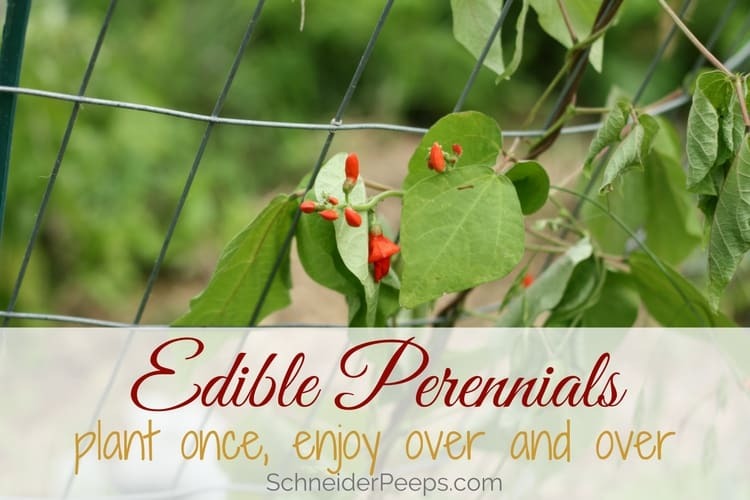 It looks like you have a picture of a Turk’s Cap on your page with “Edible Perennials”. Are Turk’s Cap flowers edible? Hi Flo, I’m so glad you like the site. 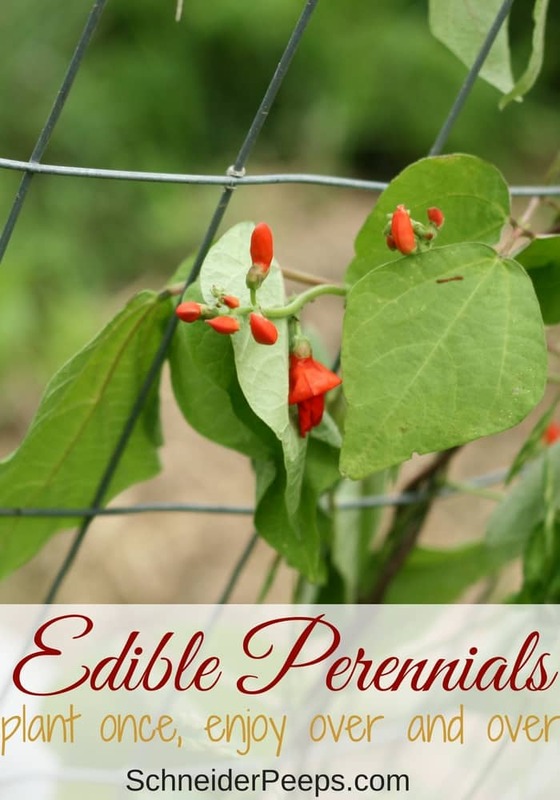 The photo in Edible Perennials is actually scarlet runner beans, not Turk’s Cap. As far as I know Turk’s Cap isn’t edible but the pollinators love it! The berries or fruit of the Turks cap is considered edible. Although it isn’t very tasty and the texture isn’t that appealing much like Barbados cherry. Kind of grainy. Chickens love them though so they would be a good plant to have around a coop. I would do your own research since it has been some time since I have read up on it. It might be worth it to dry them and use in teas if they are high in vitamins. Thanks Katy! I’ll have to look into the fruit. I just planted a turks cap out front. I live in zone 9B Pasco Co. FL. You forgot to mention Okinawa Spinach which is a perennial. It has top green leaves and purple underneath. It tolerates the heat. Easy to propagate and has a good taste. Also Katuk is a perennial bush and likes part sun. The leaves and berries can be eaten raw and sautéed . Hey Charlotte, thanks for the suggestions. I’ll have to look for both of those to plant. I’ve never heard of the Katuk but I’m excited to try growing it. And it would be really great to be able to pick spinach during the summer.